Using the 2nd from smallest stitched circle die, cut out the copper circle. 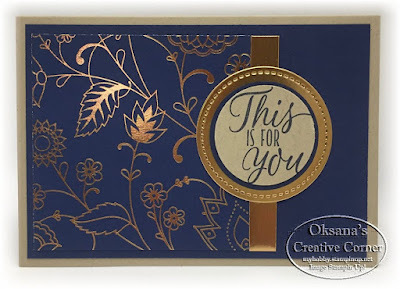 To avoid the scarred lines of your cutting pad to transfer to the foil sheet, lay a piece of computer paper between the die and the top cutting pad. Stamp “This Is For You” in Night of Navy ink on a scrap of Crumb Cake. Punch out words with the 1 3/8” circle punch. Punch out Navy layer with the 1 ½” circle punch. Adhere the words and the navy circle together with SNAIL adhesive. Attach the layered words to the copper stitched circle with a dimensional. 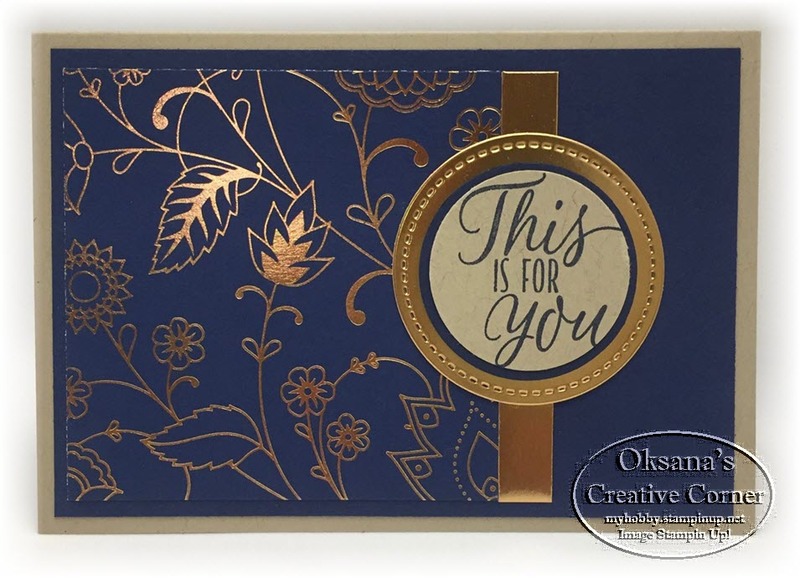 Layer the Navy on to the note card base, then adhere the 3” x 3” piece of patterned paper. Attach the 3/8” strip of copper foil with glue dots. Adhere the stitched circle with the words to the card with glue dots. This set is on 25% discount promo now!